Approch : When we looked in to the requirements, first approach of building solution was to provide additional InTouch based client packages for each of the process station in the plant as they already have server installed in the plant with few clients. The second thought was…. is it really required to propose InTouch client licenses just for notifications. I felt proposing the InTouch client license might just be an over kill (no offence to the capability of InTouch, I know this is one of the best Automation package solution available in the market today), its like to scare ‘Ant’ we are sending ‘Elephant’.. Too much is in it…? 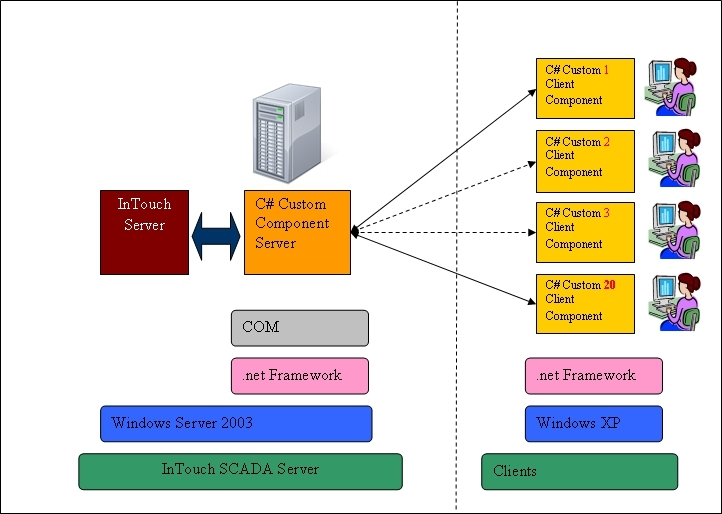 Server continues to have Wonderware InTouch SCADA installed and being used. On any event failure, server would notify custom component (acts as a server) developed in the C# and this in turn will notify to its client components installed in different machines. There is nothing call the best solution, the solution that take care of customer needs within budget, provides stability in operation and adds value to customer can be called as “Best fit solution”. I am glad to share with you all as this is one of them. Share your views if you have any interesting ways of providing same solution in different ways.